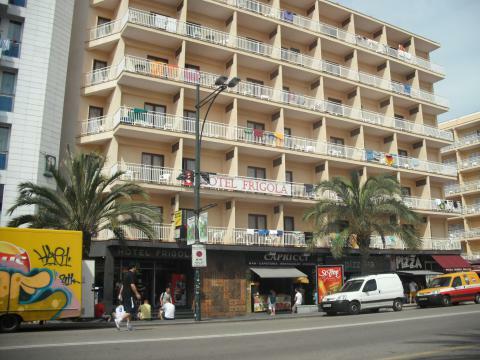 Frigola Hotel, Lloret de mar...we stayed here in May 2011 and it was truly awful!. It was very cheap and so we didnt have high expectations, I do understand that generally you get what you pay for but this place was appalling. Run down and dirty with staff that were resigned to a summer of abuse from the very young, noisy guests...its a problem. The reception staff were fine with us because we didnt complain, we are older and I speak Spanish, in fact they even offered us a room at the top of the hotel as it was less noisy but the thought of being in a lift with any of the youngsters was enough to persuade us to stay put on the first floor. When you return to the Frigola at night, there are TWO guards in reception watching for trouble, which is fine downstairs, unfortunately they dont stop the 5am football games upstairs or the door slamming or shouting, there is never a minute of the day or night that is quiet in this hotel. The Frigola hotel is too run down to attract family tourism and of course the 'cheap' youngsters often forced to stay 3 or 4 persons to a scruffy room designed as a twin, have no respect for the place/people at all...its a problem.